Yooooour New England Patriots! : Patriots 2015 Season Primer! Does the departure of four cornerbacks deflate hopes for another championship? Is there less pressure to win it all in the wake of the magical 2014 run? And are the Patriots courting disaster by vacating the secondary, or are they appealing to the fan base by pumping up the front seven in hopes of suspending opposition passers with an official push for more pressure? A look at the 2015 roster reveals lost depth and experience at two positions: running back and defensive back. It could come back to bite them, just as the inexperienced offensive line did early in the year last season. Oh, and the offensive line is a question mark to start this 2015 season, too. Here is a primer on the off-season doings, how things looked in the preseason, how the new parts are likely to fit with the scheme, and of course, the annual attempt to predict the outcomes of every game -- before the season even starts! Hello: TE Scott Chandler, TE/OL Michael Williams, OL Shaq Mason, C David Andrews, G Tre' Jackson, WR Chris Harper, RB Dion Lewis, and RB Tavaris Cadet. Good-bye: RB Shane Vereen, RB Stevan Ridley, RB Jonas Gray, TE Tim Wright, OL Jordan Devey, and WR Josh Boyce. 1. Line To Be Offensive Again? This temporary glitch in the Matrix is likely due to the recent placement of predicted starting center Bryan Stork on injured reserve (with a designation to return). This preseason Stork never touched the field, and Wendell barely played. Wendell is a decent player, but Stork's promotion to full-time center settled down the line after last September's problems. 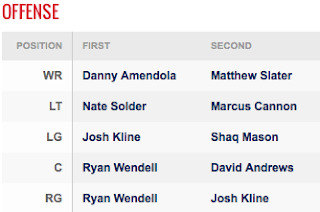 Tackle Nate Solder should be better a year removed from cancer surgery, and right tackle Sebastian Vollmer looked decent in the practice games. The problems come behind the three starters. Will Josh Kline (the listed starter at left guard) play well enough to justify the promotion after only 5 starts in 19 games last year? What will rookies Mason, Andrews, and Jackson bring to the table? And what is Marcus Cannon still doing on the team? The Patriots face very tough defensive lines in the division this year. The only saving grace is they have just one AFC East game in the first six weeks of the season. But if the offensive line takes time to gel, they could find themselves behind in the division for a change. 2. Two Tight End Offense, Round Three! Post-Hernandez, last year the Patriots added Wright to the team, hoping he'd provide a better second-tight end option than Michael Hoomanawanui. They were only mildly impressed; five of Wright's six touchdowns came in blowout wins, and he still shared time with the stiffs at that position. Wright now toils for Tampa Bay again. Enter 6' 6" Scott Chandler, a thorn in the Patriots' side for years in Buffalo. Chandler has the size to be a target in the red zone, and he will take pressure off all-world tight end Rob Gronkowski. Teams can't double Gronk and receiver Julian Edelman without leaving a jump-ball option with Chandler, which is exactly what the Patriots want. Quarterback Tom Brady threw only one touchdown all preseason, and it was to Chandler. That throw, down the sideline to a spot where the tight end was headed, showed Brady trusted Chandler and that the new target understood the offense well enough to be effective. Those factors put Chandler ahead of all the receiver washouts over the years. Expect him to catch at least 8 touchdowns this year. And if teams slide their defenses toward Gronkowski and Edelman, Chandler's total could be even higher. Brandon LaFell appears to have entered the witness protection program, no one's seen much of Edelman, and Danny Amendola would be Edelman's replacement (even though he'd still be a disappointment at his salary numbers). Both Harper and veteran wide receiver Aaron Dobson showed flashes in the preseason. If one or both of last year's receivers can't get on the field, it'll be a chance for these guys to shine. It'll also be a chance for them to trip all over themselves -- so if Edelman and/or Amendola can't play, hold your breath. I wrote in May (link) that Brady would be supremely motivated to destroy every opponent this year. And nothing that's transpired since then changed my mind. Brady and Belichick will do everything in their power to win every game in 2015, and savor sweet revenge on any team that disrespected them or was involved in the DeflateGate situation. The line on the Colts game could be Patriots -21.5, and no doubt both the quarterback and head coach will look to embarrass Indianapolis for their childish tantrum after they got destroyed in last year's playoffs. Oh, and if you don't think this will be a factor, just check the box scores in 2007. In the wake of Spygate, the Patriots beat opponents by an average of almost three touchdowns (average winning score was 37-17). Hello: DL Jabaal Sheard, DE Trey Flowers, DT Malcom Brown, DT Khyri Thornton, LB Rufus Johnson, LB Jonathan Freeny, CB Bradley Fletcher, and CB Tarell Brown. Okay, not quite complete. But four starters from the last two years are gone. One-year wonders Revis and Browner, two-year starter Dennard, and long-time slot corner Arrington all took their talents elsewhere. Their eager replacements are enigma-corner Logan Ryan and Super Bowl hero Malcolm Butler. Butler looked great in the preseason, both in pass coverage and run support. He got the starter treatment this August, playing a few series and then heading to the sideline to rest for three quarters. He's no Revis, but he combines good ball skills with relentlessness and attitude you need to play the position. Ryan was up-and-down in August, showing some nice technique one play and then getting beaten badly the next. Some observers are counting on Tarell Brown to take the second starting position. But even if he does, Butler/Brown is quite the drop-off from Revis/Browner. All of that said, the team might miss slot-corner Arrington more than anyone. It was no accident that slot receivers had such a tough time against the Patriots; Arrington had the right build to stay with smaller, shiftier receivers, and had the fight to make them earn every inch. Alan Branch (6' 6", 350 lbs. ), Sealver Siliga (6' 2", 325), Dominique Easley (6' 2", 285), Malcolm Brown (6' 2", 325), and Khyri Thornton (6' 3", 315) total 1550 pounds of interior muscle. Should be pretty stout against the run this year. Against the pass, these brutes need to push the pocket into the quarterback. And that should open up sack opportunities for talented veterans Chandler Jones and Rob Ninkovich, along with newcomers Sheard and Flowers. All four outside linemen should flourish in the new 4-3 alignment. Jones and Ninkovich will get more one-on-one looks, and both Sheard and Flowers looked surprisingly good in the preseason. It appears the Patriots will make up for the loss of cornerbacks by trying to collapse the pocket. Siliga looked downright bad in the preseason, but if he rounds into form they should have the personnel to rush opposing QBs. 3. 4-3 or 5-2 Defense? At least half the Patriots games will be against teams with poor quarterback play and decent running games. So expect more and more of the 5-2 defense, with extra defensive linemen clogging up runs and rising star linebackers Dont'a Hightower and Jamie Collins covering short zones with their superb speed. The Pats used this alignment to great success against the Jets and Seahawks last year. So don't be surprised to see this formation mixed in against the likes of the Bills, Jets, Washington, Texans, and perhaps even the Eagles. Hello: LS Joe Cardona and coach Joe Judge. Good-Bye: LS Danny Aiken and coach Scott O'Brien. Cardona had some poor snaps in the preseason. Notably one punt snap that screwed with the timing on coverage and at least two field-goal snaps where punter Ryan Allen saved the attempt with a great hold. This only becomes a problem if the new guy can't get is straightened out, or if he gets the yips in pressure situations. Oh, and Cardona should watch his back -- Aiken did not sign with another team, so he could always come back if things don't go well this year. In the preseason the team was more aggressive about returning kickoffs from deeper in the end zone. Credit new coach Judge for the new assertiveness. This often happens with new special teams coaches -- in fact, retired coach O'Brien was more aggressive than his predecessor. And here goes the annual attempt to predict which games the Patriots will win and lose for the season. I nailed 13 out of 16 last season (and that last game against Buffalo just shouldn't count). But no matter how it goes; take it with a grain of salt. Predicting games this way is a fool's errand, and I'm just the fool to take it on! As always, the season is broken up into quarters. The Steelers come to town for opening night tonight. With all that's gone on, and with Pittsburgh deep threat Martavis Bryant missing -- which frees the New England to double both Antonio Brown and Heath Miller -- this will be a win for the Patriots. The Steelers just don't have the defensive line talent they used to, which would be the way to attack the Pats offense. The second game is in Buffalo and there are competing histories here. Brady holds a 23-3 lifetime record against the Bills (including last year's no-try loss). But new Bills coach Rex Ryan knows how to give Brady a hard time like almost no other coach. Also, the Patriots have 10 days to prepare, but the Bills strength (front seven) plays to a Patriots weakness (offensive line). This is likely the toughest prediction all season; but I'll go with a Patriots loss, with home field being the determining factor. The Jaguars won't put up enough of a fight in Foxboro the next week, so mark that down as a Patriots win. The bye comes early, and then it's off to Dallas to take on the Cowboys. This is a difficult matchup; balanced offenses often give the Patriots trouble and the Pats don't have a defensive back big enough to tame Dez Bryant. But Belichick's record against the NFC is a stellar 48-17 (73.8%), and that includes 3-0 versus the Cowboys. Their post-bye record is also excellent. Patriots eke out a win here. A lot of fans don't give the Colts any chance in this game. They suspect the Patriots will pull out all the stops to crush Indy after they whined about deflated footballs. But bear in mind that the Colts will have 10 days to prepare, and the Patriots are on a difficult two-game road trip. Also, the Patriots secondary is less-equipped to stop the high-powered Indy passing game. However, even with all that, the Colts have done nothing to shore up their run defense. Expect a shootout with the Patriots emerging victorious in a close one. The stinky Jets come to town next, and I don't expect them to take the game in Foxboro. Maybe in New York; more on that later. The Dolphins have more defensive firepower but less on offense, so they won't be able to keep up in their visit to Gillette, either. Mark down a win here. Washington needs an overhaul to challenge the Patriots, so this should be victory #7. Buffalo comes to Foxboro, and they won't beat the Patriots twice in one season, so this should be another win. Factors going against the Patriots in Denver: short week, road game, thin air, Thanksgiving holiday to handle, new defensive coordinator Wade Phillips, and difficulty stopping the stretch-run concept in the past. A perfect recipe for loss #2. The Eagles come to Foxboro next, and this is the most intriguing matchup of the year. Chip Kelly with 10 days to prepare, Bill Belichick's first look at the fast-break offense, big interior defensive linemen panting for breath, and in-game adjustments by both sides like never before. When all is said and done, this should come down to the health of Sam Bradford. And I suspect he'll play, so it's a Patriots loss. Houston could be a tougher out than people think. The defense is very active up front, which could spell trouble for the Patriots patchwork offensive line. Also, both head coach Bill O'Brien and defensive coordinator Romeo Crennel will pull out all the stops to take down their former team. I don't see usually foresee two losses in a row, but it looks that way this time. The Titans roll into New England after that. Sometimes young quarterbacks have success against Belichick's defenses, but after the Patriots have about 8 or 9 weeks of film to study, it becomes advantage New England. This game will be rookie Marcus Mariota's 14th start; so expect the Patriots to be able to handle him. For the second consecutive year, the Pats travel to New York to take on the Jets in week 16. By then, Todd Bowles' system should be fully implemented, which could make the game more difficult. However, expect the New England line should be in good shape by December, so expect them to win on sheer offensive talent (of which the Jets have precious little). The house of horrors that is Miami comes late this year. But weather should not favor the Dolphins, and the Patriots have started to figure out Ryan Tannehill, so expect the Patriots to win this one. If all those predictions come true, the Patriots will be 12-4 and playing for a playoff bye. Enjoy the game and the season!